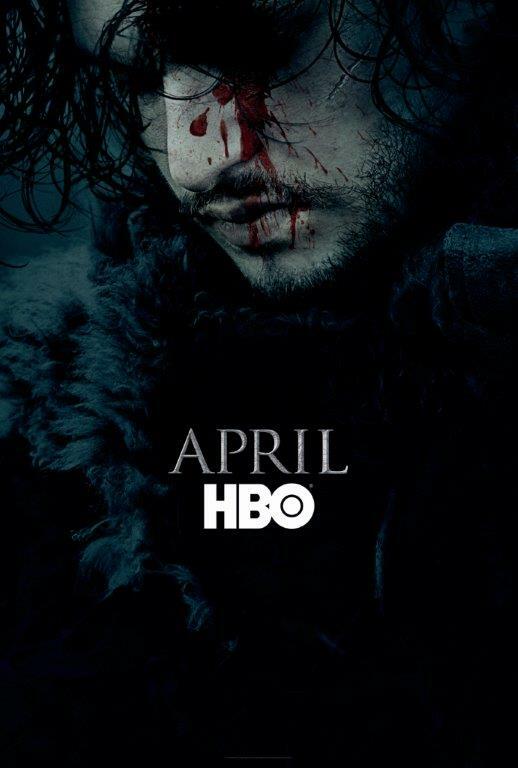 Season 6 of HBO’s Game of Thrones is set to return in April 2016 and the teaser poster features…Jon Snow! The season 5 finale of Game of Thrones “Mother’s Mercy” left fans with much to speculate about and cry over. Sansa (Sophie Turner) and Theon (Alfie Allen) escape Winterfell by literally jumping off a cliff. Arya (Maisie Williams) when she returns to the Hall of Faces is struck blind as a consequence to killing Ser Meryn. Stannis (Maxwell Laird) coming off allowing his daughter Shireen (Kerry Ingram) to be sacrificed to the Lord of Light by Melisandre (Carice van Houten), comes to find his wife Selyse (Tara Fitzgerald) hanging from a tree. With the death of Selyse, Melisandre doesn’t have a magical excuse to stand on, so she skidaddles along to Castle Black. Stannis future isn’t looking to bright with both his family and power gone, he meets his end by the blade of Brienne (Gwendoline Christie). In Kings Landing, Cersei is forced by the High Sparrow to perform the walk of shame through the city streets. For me, this was one the most disturbing scenes of the series. However, the item that had individuals calling out work the next day and ready to flounce Game of Thrones was seeing the angry Night’s Watch brothers label Jon Snow (Kit Harington) a trader and stab him repeatedly “For the watch.”, with the final blow being delivered by Olly (Brenock O’Connor). In the final scene of the series, we see the Night’s Watch turn their backs on a wounded Jon and he blood stains the snow he’s lying upon. Speculation is at an utmost regarding what will happen to Jon because we haven’t seen Ghost, nor has Samwell (John Bradley) seen Jon’s demise? And now that has been somewhat been put to rest with HBO’s Game of Thrones season 6 teaser poster, stating the series will return in April 2016 and showcases a bloody Jon Snow. JSnow must be returning, right?! HBO wouldn’t tease the fans in this manner. Only time will tell. Check out the season 6 Game of Thrones teaser poster and if you can handle the feels, you can watch Jon Snow’s final scene in “Mother’s Mercy” here.